The first thing I need to tell/warn you about is that you should NOT purchase this from Amazon. On Amazon, it’s $29.99 plus $21.00 for shipping. 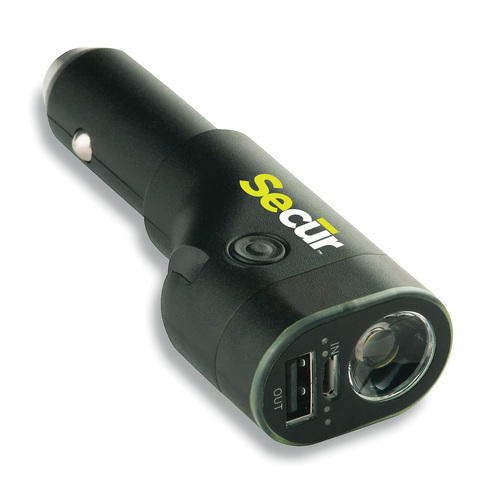 Purchase this from the Secur Products web site for $34.99 and free shipping. I’ve reviewed other Secur products on The Frugal Networker and I’ve never been disappointed with any of them. They always do what they say they’ll do and the build quality is superior. None of the Secur products that I’ve tested have ever failed or broken–even after multiple years of use. The SP-4003 Six-in-One (6in1) is no different. It is a superb product that does more than just charge your mobile phone when plugged into your car. The 6in1 is a must have device for anyone who travels any distance at all on a regular basis. It is an emergency tool and you can keep your mobile phone charged on the way. It has a flashlight, an emergency flashing beacon, a seatbelt cutter, a window breaker, and a USB port. If it also functioned as a wallet, you wouldn’t need anything else. My daughter and I have been using this product for the last month. She just drove from Oklahoma to her college in LA. As a dad, this was the perfect item for her to have in her car at all times, because I knew if she had any troubles she could cut off her seatbelt quickly. Also, she did not have a reason she could tell me her battery was dead on her cell phone. As she drove cross country, she was able to utilize the charger for her phone while she was navigating the highways from Oklahoma to California. While driving, we could use the flashlight and not turn on the overhead light in the car which would cause distraction to the driver. We were able to find change that had dropped on the floorboard much quicker. Once the phone was dead it took the normal amount of time to recharge the phone from the device. The other feature that’s available on the charger also put me at ease is the window breaking tool, which we did not test, but I know she has that it if she were to get trapped. She carries the 6in1 in her Coach handbag. One other feature I liked being a dad, was that it has an emergency red blinking light. I feel better knowing she has this device on her person while she is living in California away from me here in Oklahoma. She rides the bus, trains, and Uber, so I know she can get a quick charge on her phone and use it to get herself out of harm’s way if needed. The 6in1 does not take up much space in her hand bag; it fits perfectly next to the can of mace I gave her. There you have a testimonial from a happy customer. Why it’s Frugal: The Six-in-One Charger is frugal because it is a multifunction device for the same price as many single function chargers on the market. For $35, you can have peace of mind and a charge for your mobile phone, no matter where you are. The peace of mind alone is worth far more than $35. Just ask Joseph. I’m not sure that I can say more than Joseph did in his testimonial. But to summarize, the 6in1 is a safety device and a charger. You can charge your mobile device while driving or while walking, watching a football game, or taking a bus ride. And you can find your keys in the dark, cut your way out of a bad situation, or break glass in case of whatever. I’d say that the 6in1 is a premium device that is well worth the money. Recommendation: Buy one for yourself and for anyone you care about.